Cool peppermint candy canes, sugar-dipped cookies, creamy hot chocolate with marshmallows melting on top…when I was a kid I loved them all! And our big holiday shopping trip to the local mall wasn’t complete until I had a bag of those crispy, sweet cinnamon almonds in hand. That was quite a few years ago. I still love holiday goodies, but these days I need them to be wholesome and a healthy choice for me and my family. 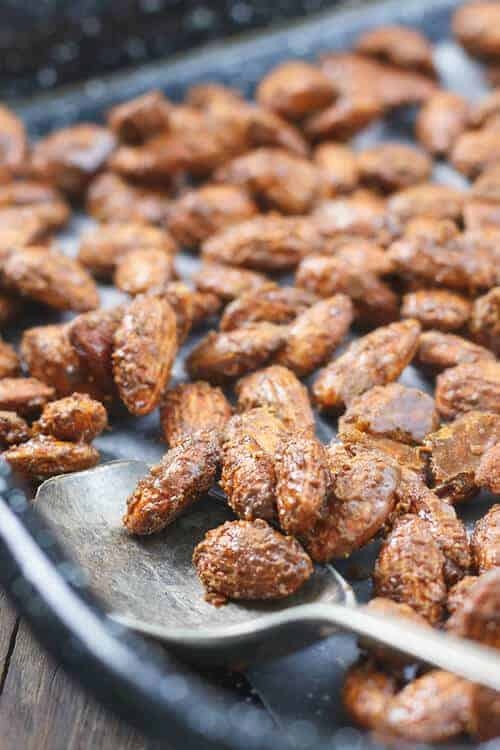 That’s why I love these cinnamon roasted Paleo almonds recipe. 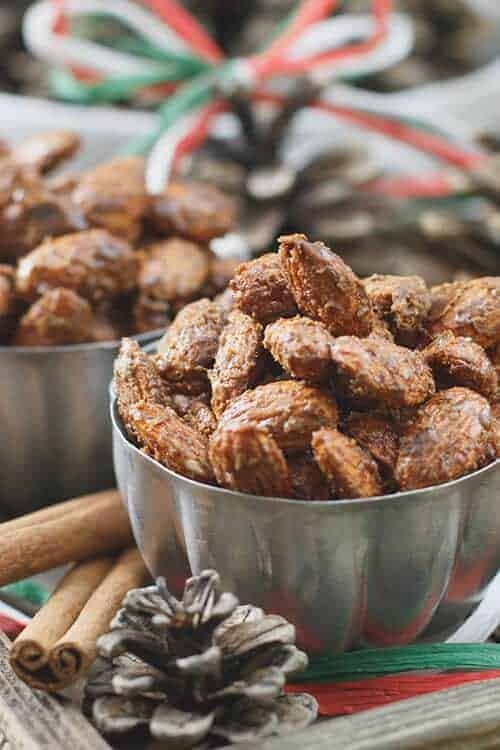 They taste just like the cinnamon almonds I remember from those magical childhood trips to the mall, but with even more warm cinnamon and buttery caramel flavor. The first time I made these for my family, no one could believe they’re made with 100% natural Paleo ingredients. To tell the truth, it was really pretty easy! I used a modest amount of organic coconut palm sugar combined with a little pure maple syrup to make the sweet almond coating. No one missed the cups of refined sugar one bit. The other ingredients are already Paleo-friendly, no changes needed. I want my cinnamon roasted almonds to be as wholesome as they are delicious, so I always choose Simple Truth brand almonds, coconut palm sugar, pure maple syrup and pure vanilla. I can always trust Simple Truth ingredients because they’re organic, natural and purely delicious. They help my recipes taste their best, and I know they’re a healthy choice for my family. 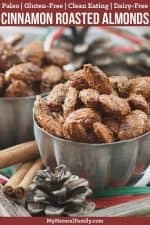 Make a batch of these nuts for your next holiday get-together and watch how fast they disappear! I’ve learned it’s best to make a big batch so there’s plenty for everyone. And I have a little secret – I sometimes make a batch just for myself! If your weather is on the humid side, add an extra 15 minutes on to the baking time. These nuts make very popular gifts! For best results, wait until they’ve been out of the oven a day or so to pack them in gift bags and tins. The sweet coating can remain a little tacky for as long as 24 hours. After that, they become perfectly dry and not at all sticky. If you like your cinnamon almonds on the spicier side, add a bit more cinnamon. Try adding a little at a time, because you can always add more. 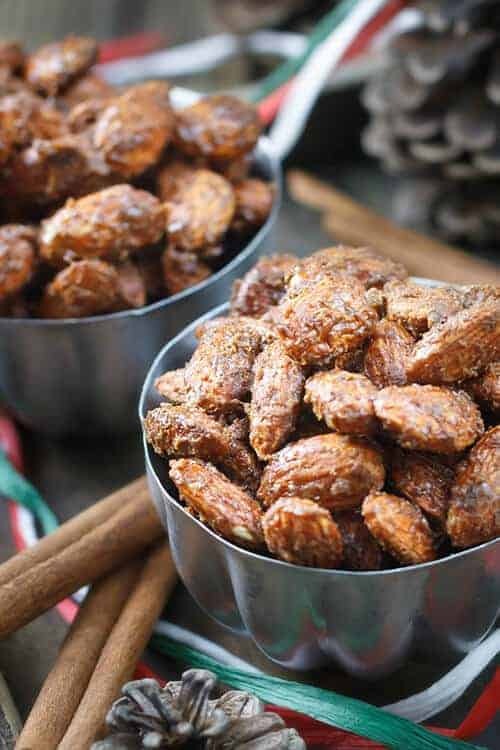 These cinnamon roasted Paleo almonds take the classic holiday treat and make them healthy. You can’t even image how good your house smells when you make these! Heat oven to 250 deg. Line a large cookie sheet with a silpat mat or lightly greased parchment paper. Beat the egg whites until they’re frothy and thick. Beat in the maple syrup and vanilla until the mixture is very thick and creamy. In a separate bowl, combine the coconut palm sugar, cinnamon and salt. Fold the nuts into the egg mixture. Gradually fold the coconut palm sugar mixture into the nuts and eggs until the nuts are well-coated. Spread the nuts in an even layer on the cookie sheet. Bake for 1 hour and 15 minutes, stirring about every 20 minutes for even cooking and to prevent sticking. Large clusters are easily separated with a pair of forks. delicious as-is. When the time’s up, turn off the oven and leave the nuts inside to slowly cool. This helps them get extra crisp and crunchy. Store the nuts at room temperature in an airtight container. The coating may feel a little tacky the day you bake them but will dry completely overnight. Why are these labeled as vegan when they have egg whites in them? Crap. 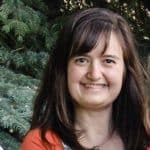 Cause I’m blind, apparently. Guess I’ll have to fix that everywhere. Thanks for pointing that out.